It's a perfect painting. You have get the calm expression of the animal. Congratulations. Sorry for my awful English, I'm wrainting from Spain, in Europe. Ana, thank you and welcome to my blog. You don't need to apologize for your English--it is much better than my Spanish! Don, this series your on is just fantastic. 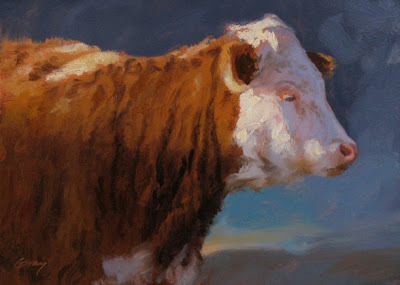 The feeling and personality you have giving each of the cows is marvelous, not to mention your masterful color palette..
Wow, Gerald--thanks a lot for those encouraging words!